Redesigned with the 10th MouseHunt Birthday in mind, this version of the Storm Wrought Ballista Trap fires a thin harpoon hidden in a coat of wax akin to a candle. Once lit and launched, the wax melts away in flight, exposing the business end of the harpoon, allowing it to pierce its target! The 10th Birthday Storm Wrought Ballista Trap Skin can be used on the Storm Wrought Ballista Trap. The trap's stats (power, power bonus, attraction bonus, etc.) are not changed. 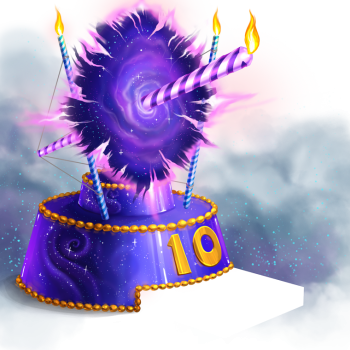 The 10th Birthday Storm Wrought Ballista Trap Skin may be made available during the annual MouseHunt Birthday event and can be traded on the Marketplace or through Give To Friends. 5 March 2018: The 10th Birthday Storm Wrought Ballista Trap Skin was released as part of the MouseHunt's Tenth Birthday. This page was last edited on 22 March 2018, at 17:16.